The CGC-1e Complete Greenhouse Controller controls all of the main devices required in today's modern hydroponic garden & mdash; your HID lights, supplemental CO2, hydroponic pumps and exhaust fans or air conditioner. Your garden's HID lights are controlled by a precision 24-hour time clock. Two outlets are provided for your lights. Other functions such as supplemental CO2 and hydroponic pumps are also coordinated with the time clock. Two of the outlets on the CGC-1e are for your exhaust fans or air conditioner. A built-in thermostat and humidistat handle the growing area's temperature and humidity control functions. The two pump outlets allow your water pumps to be controlled by the built in Adjustable Recycling Timer. A selector switch allows the user to determine if the hydroponic pumps are to cycle only when the lights are ON or 24 hours a day. An auxiliary NIGHT outlet is activated when the lights are turned off. Supplemental CO2 is coordinated to work in harmony with your exhaust fan's temperature and humidity control functions. When the exhaust fans are running, the CO2 outlet is disabled to conserve CO2. 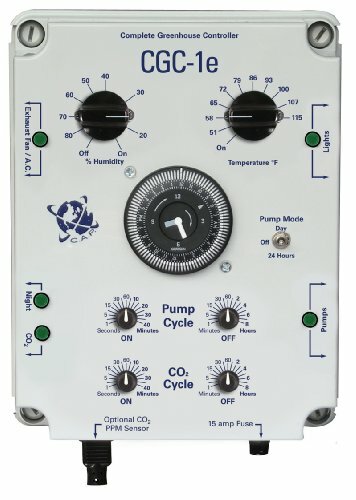 Two standard built-in timers control your CO2 valve or generator. The CGC-1 can be upgraded to parts per million accuracy by plugging in the PPM-1c CO2 monitor. The CGC-1 is rated for 15 amps at 120 volts.